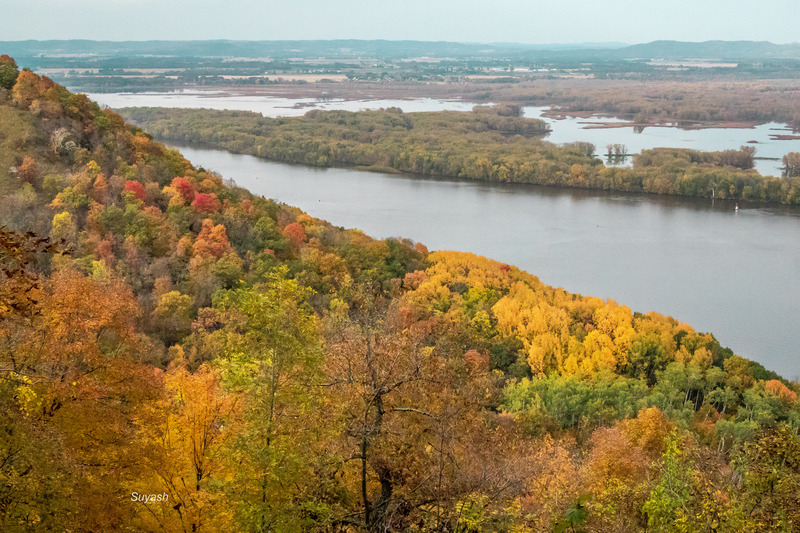 Great River Bluffs State Park is one of the beautiful parks in the state of Minnesota, providing breathtaking views of the Mississippi River and the valley. Located 150 miles south east of Minneapolis, this state park can be reached within 2.5 hours of driving from Minneapolis. It lies on the scenic route of Great River Road Scenic Byway of Minnesota which runs parallel to the river Mississippi. As one says the best part of the travel is the journey or the road taken, you can actually experience this if you are driving on the Great River Road enroute to the State Park. 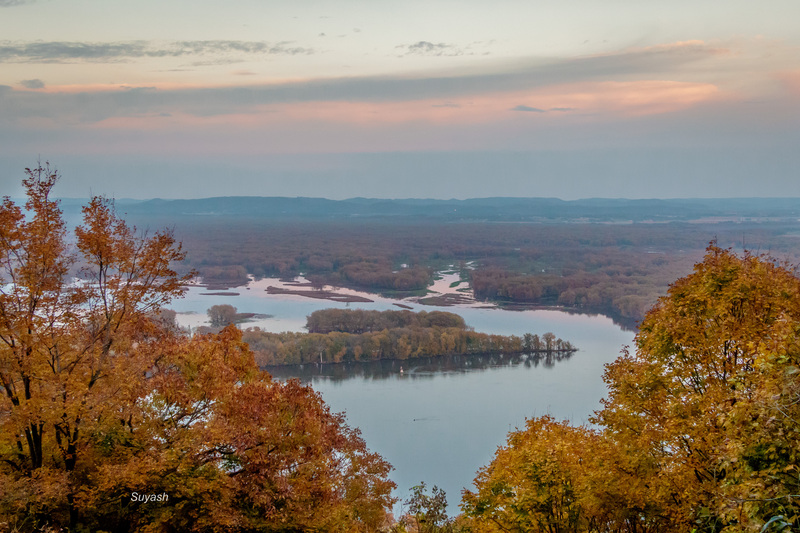 Apart from the journey, the destination – Great River Bluffs State park – is equally rewarding for nature lovers and photographers. One can see the layers of sedimentary and dolomite rocks deposited millions of years back on the bluffs in this park. Unlike most parts of Minnesota, which were covered by glaciers, the area where park is located was interestingly never part of any glacier. This is the unique history of this place. What to do: There are several overlooks in this park, and all of them give scenic vistas of the Mississippi River and the valley. It is an excellent place to do landscape photography. Not to be missed are the shots of variety of plants and wildlife. Bald eagles can be spotted in this park during the winter. One can do camping in the park and also has picnic tables and benches, from where one can leisurely enjoy the beauty of the valley down below. There are hiking trails of 6.5 miles for nature lovers. Cross-country skiing is also available for the most adventurous souls in winter. When to Visit: This park is open throughout the year and any day is a good day to visit it. Fall season is especially a good time to visit to enjoy the changing colors of leaves on the bluffs and the river valley. I had clicked these shots during fall season last year. Entrance Fees: $5 per vehicle. However i would highly recommend to buy an annual pass of Minnesota State Park, which costs $25 and is good for unlimited visits to Minnesota state park for the entire year. For me, this has been a real cost saver as i have visited several state parks since i bought the pass, and have already recovered the cost of this pass after my fifth visit to any of the state’s parks. Let me know if you have visited this park or any of the Minnesota State parks. 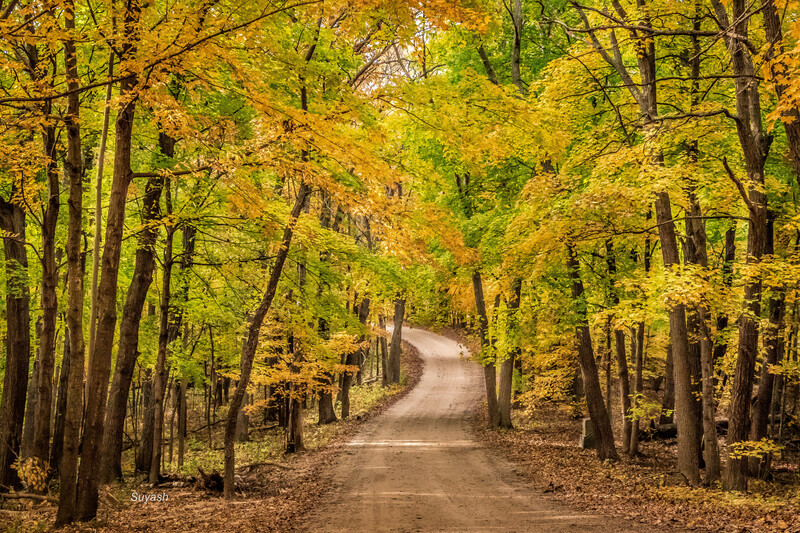 This entry was posted in Fall Season, Minnesota, Nature, Photography, Sunset, Travel, USA and tagged Best Fall Color Drives in Minnesota, Buy Minnesota State Parks Permit, Great River Bluffs State Park, Great River Road Scenic Byway, Landscape Photography, Minnesota, Minnesota Fall Color, Minnesota State Parks, Mississippi river, State Parks in USA, Sunset Colors, Sunset Photography, Travel. Bookmark the permalink. Enjoyed your blogs-the three I read at least. Thanks for sharing! Thanks so much Steve. I am glad you enjoyed my blogs. I am enjoying your photographs. Gorgeous … love the first shot! Absolute fun, I must say. Thanks for dropping by. Wow there’s nothing more beautiful than Nature!! So soothing, relaxing, appreciating it’s beauty and ease…just looking at your pictures brings a feeling of ahhhh. Gorgeous! Thanks so much Deb. I am glad you enjoyed my pictures. True, there is nothing more soothing and breathtaking than nature and for me, the landscape photography. Have a great weekend. Nice post with helpful info. It piques my interest in Minnesota! Beautiful pics. Looks like a gorgeous place to visit! What an inviting road. I want to explore! Looks so serene and beautiful. Great place for nature lovers Suyash. The place is looking beautiful… With shades of the fall season. Thanks for shatiy. Do you live in Minneapolis? It’s a beautiful park and is especially colorful during fall season. We had visited last October there on a road trip and we completely enjoyed it. Yes dear. I am currently in Minneapolis.